The Governor of North Carolina is the head of the executive branch of North Carolina's state government and serves as commander-in-chief of the state's military forces. The current governor is Roy Cooper who took office on January 1, 2017, with a ceremonial inauguration held on January 7, 2017. 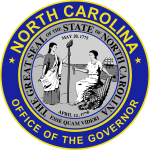 Well into the twentieth century, the North Carolina state constitution made the state's governor one of the weakest in the nation. 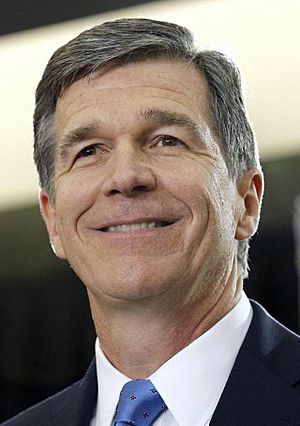 Until an amendment was added to the state constitution in 1971, North Carolina Governors could only serve a single four-year term and could not run for re-election. After the amendment was passed, in 1980 James B. Hunt became the first governor in state history to be elected to a second term. Governors are still limited to only two consecutive four-year terms, but they may run for further non-consecutive terms. Governor Hunt did just that, winning election to a third and fourth term in 1992 and 1996 after being out of the office for the eight years between 1984 and 1992. The Lieutenant Governor is also limited to two consecutive four-year terms. North Carolina was also the last state in the Union to give its governors veto power over legislation, this was not added to the state constitution until a referendum in 1996. Much of North Carolina's traditional resistance to strong executive power came from the harsh treatment the state suffered from British Royal Governors in the colonial period before the American Revolution. After the state gained its independence from Britain, the state constitution deliberately weakened the executive branch of state government and strengthened the legislative branch. Since the end of Reconstruction in the 1870s the overwhelming majority of the state's governors have been Democrats. The only Republican to be elected Governor between 1876 and 1972 was Daniel L. Russell, who served 1897–1901. As Republican strength grew in North Carolina in the 1950s and 1960s the state's gubernatorial elections became increasingly competitive, and in 1972 James Holshouser became the state's first Republican governor of the twentieth century. Even so, Republicans have still had difficulty in winning gubernatorial elections in North Carolina, and the office has usually remained in Democratic hands. Governor of North Carolina Facts for Kids. Kiddle Encyclopedia.